The Epcot Character Spot was a MUST HAVE on my Epcot Fastpass list – my son LOVES Mickey and pals – so the chance to meet them ALL in one spot is a necessity! When we were here years ago, it was the “fab five” – Mickey, Minnie, Donald, Goofy and Pluto – and I am not sure all 5 are still here regularly – but no matter to us – we will love whoever is there for hugs and photos and autographs! Spaceship Earth – This is a ride that used to have little to no standby wait time, but has grown largely in popularity recently, and has experienced wait times of 45-60 minutes. And since I love it – I want to make sure it’s one we are able to do – so it rounds out our fastpass list for Epcot! 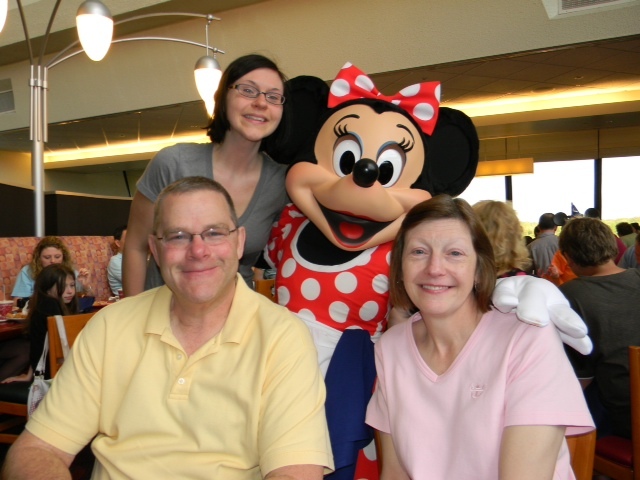 I am pumped to be getting closer to our WDW trip – we are under 3 months now on our countdown! And I have been working diligently on planning the trip – making lists for packing, purchasing things here and there for the trip, and of course making Fastpass+ lists – check out my ones for Magic Kingdom and Hollywood Studios, and stay tuned next week for my Animal Kingdom picks! 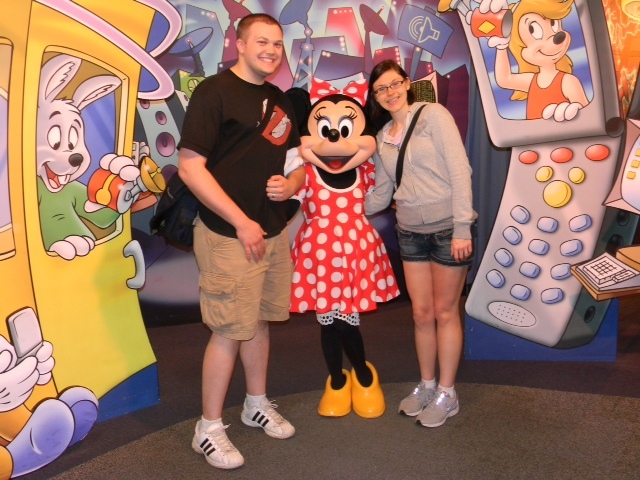 Minnie has been making us smile for years – and I have to admit she is a personal favorite of mine, and whenever I go to WDW, I make it a point to seek her out and have my picture taken with her. 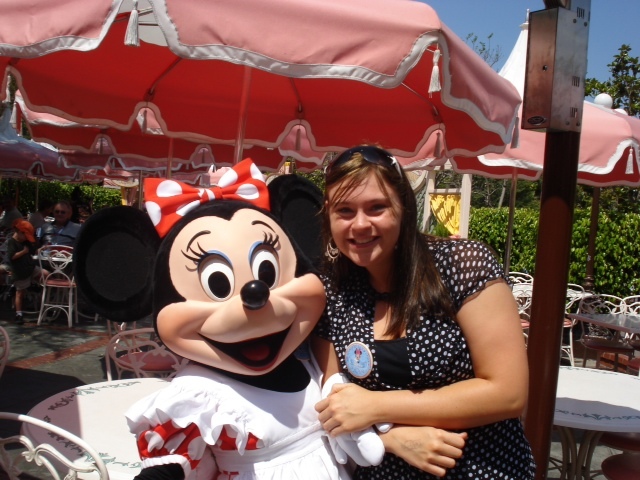 Her dress, her shoes, her bow, her polka dots – she is a fashion icon! In Epcot, you can meet up with Mickey, Minnie, Pluto, Donald, and Goofy at the Epcot Character Spot! The fab five also make a daily appearance for breakfast and dinner over at the family-friendly Chef Mickey’s restaurant – the food is served buffet-style and you can enjoy the eats while the characters make the rounds for pictures, hugs, and autographs! Minnie hosts a character buffet breakfast at the Plaza Inn in Disneyland – she even dons a cute apron for the occasion! 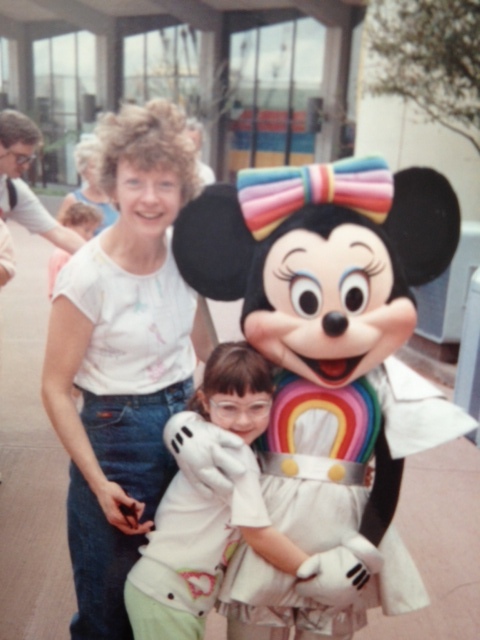 And what tribute to Minnie Mouse would be complete without an adorable old school flashback shot (circa late 80’s)? Note my mom’s perm – gotta love the big hair!